The CXR is the ultimate performance cyclocross pedal for riders looking for lightweight, durability and strength. The Posi-Lock retention system allows superior adjustability and easy rapid engagement action. Specially designed larger front retention claw maximizes positive entry in wet and muddy conditions. Cromoly spindles are paired with three precision cartridge bearings minimal maintenance. CXR is available in five anodized colors: black, gray, blue, red and orange. Looking to shed weight from Shimano SPD pedals but don’t want to switch pedals on all your bikes? Or hoping to add a bit of colorful bling to your ride? 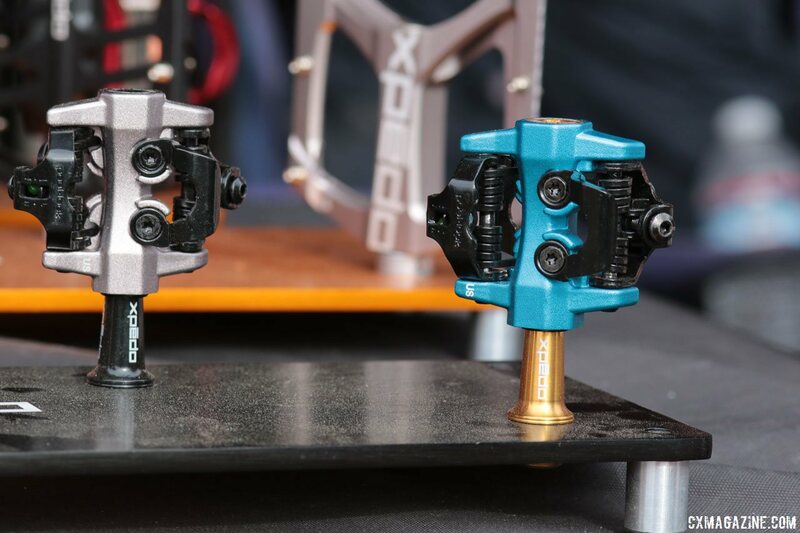 Xpedo’s annodized CXR cyclocross-oriented clipless pedals have been one of our favorite non-Shimano alternatives (the Ritchey XC being another), and it’s a gram-shaving option. The steel axle version of the CXR comes in a bit lighter than Shimano’s XTR version and has an MSRP that’s $70 less. 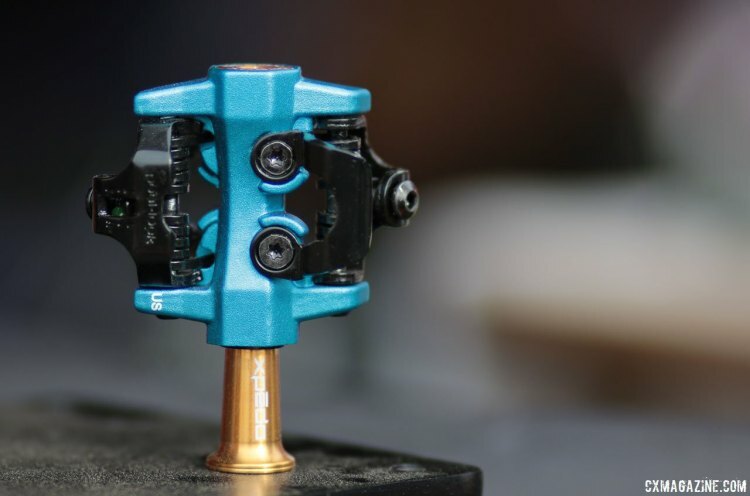 Now Xpedo has an even lighter option in the form of a titanium spindle CXR Pro pedal that tips the scales at just 240 grams. We first spied the lightweight CXR Pro pedal at Interbike 2016, but now the pedal is available and shipping. Retail is $169, $10 less than list price of an Shimano XTR M9000 XC pedal (although online retailers often discount Shimano products greatly). The gold-colored spindles of the CXR Pro command a $60 premium over the $109 CXR, and shed 55g over the CXR’s steel spindles—close to the arbitrary but commonly-cited $1/gram benchmark. There is a weight limit at 187 pounds for the Xpedo CXR Pro model with titanium spindles. Xpedo had cyclocross in mind when designing this pedal, developing an oversized front claw to ensure positive engagement in sloppy conditions. Both the steel and titanium axle models bring three sealed bearings, which have proven durable in our tests despite power washes. 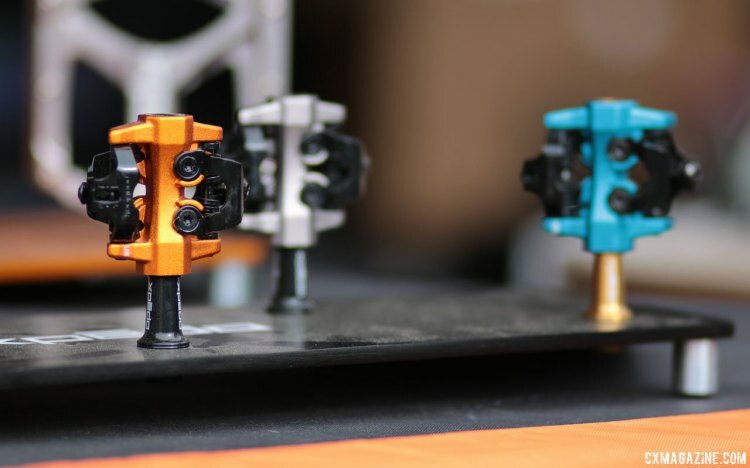 The Xpedo CXR steel version comes in five different colors including orange, red, silver, blue and black, while the Pro model with titanium axle is currently only available in black and blue. The pedal company is a sponsor of cyclocross pro Robert Marion, who has powered the CXR through all types of conditions throughout the last season and raced to fourth in the cyclocross race at Sea Otter. A little-known but not well-promoted fact that may appeal to bike fitters and racers is the ability to swap out the stock Xpedo CXR spindles for shorter or longer versions to customize your Q-factor and fit. While the pedals aren’t available with preinstalled different length axles, shorter and longer spare axles are available from the company directly and run $59.